Mommy: "Sophia! You are going to be a big sister!" Daddy: "You are going to have a little brother or sister!" Sophia: "Ooooooh! Yipee! 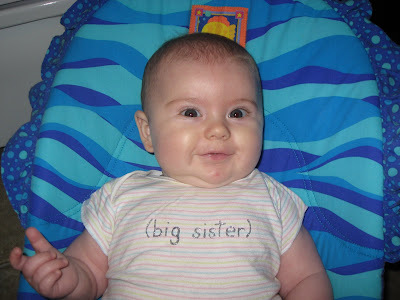 I am going to be a big sister!" This was Sophia's special "big sister" shirt that she wore to dinner with Papa Nourse, Papar and Grandma, Auntie Anna and Uncle Nay Nay. After an hour and a half, and no one had said anything about her shirt, I had to step in. I told Sophia to show everyone her pretty shirt that I made for her. 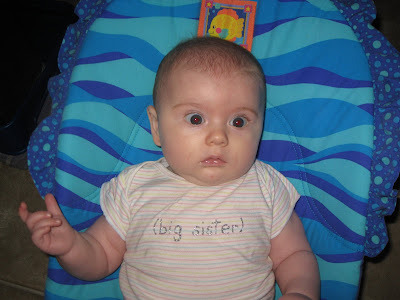 Grandma read it aloud with confusion, "Big sister?" and then looked up at us. Then her eyes got wide. Papar jumped in, "Is this one of those prego things again?" I said, "Maybe!" with a wry smile. Then everyone laughed and got very excited! Haha--"Is this one of those prego things again?" I swear, I'll never trust a photo from you again! That was a great way of telling the family. Even though you had to "tell" them anyway! Oh, by the way tell Anna I think Sophia looks a lot like her.